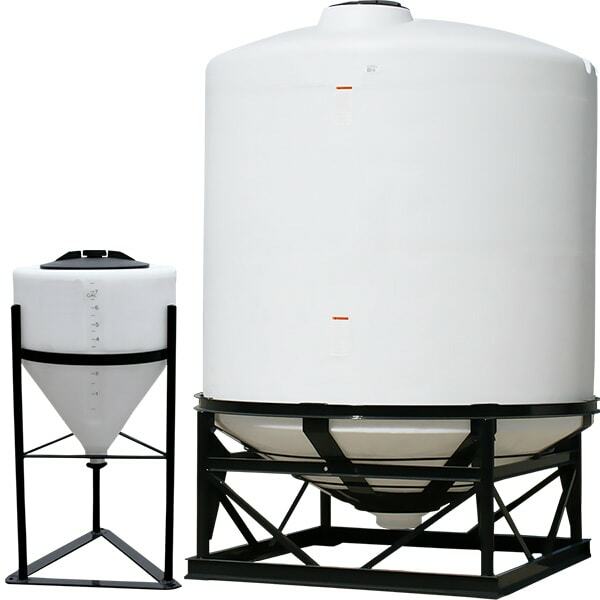 Protank offers the best plastic cone bottom storage tanks available today. All of our plastic tanks are available in 1.5 and 1.9 specific gravity. We can also offer some of our tanks in 2.0 SG. Protank’s poly plastic cone bottom tanks are rotationally molded and are available in HDPE (polyethylene) as well as HDXLPE or XLPE (crosslinked polyethylene). Cone Bottom storage tanks are used for bulk storage where complete drainage is a must. Our tanks feature tie-down slots, built-in graduated gallon indicators, an offset fill-well and a self-vented, slosh-proof lid. Our specialist can configure any polyethylene plastic cone bottom tank to meet your needs, no matter the size or shape. We can customize our plastic tanks with various sizes and types of fittings/nozzles and accessories, such as, welded flanges, welded couplings, PVC, PP, CPVC bulkhead fittings and bolted fittings, FRP or steel ladders, tie-down systems, external or internal down pipes, level gauges, valves and larger manways. If you don’t see a size or certain tank you are looking for, please don’t hesitate to contact us at 866-776-8265.